One of the top must-do experiences on any travelers or divers bucket-list is to swim with Whale Sharks – the Goliathan gentle giants of the deep blue. And one of the best places in the world to see whale sharks is off the Riviera Maya in Mexico! Every year between May to September hundreds, even thousands, of these spotted beauties congregate in the warm Caribbean ocean to chow down on the phytoplankton smörgåsbord on offer here. 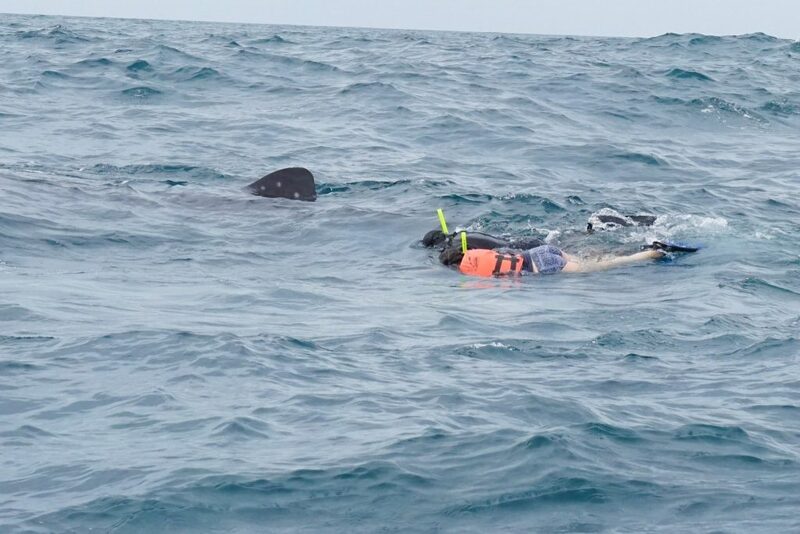 Luckily this results in a unique opportunity for snorkeling with whale sharks on a day trip from one of the worlds most popular holiday destinations – Yes, swimming with whale sharks in Cancun, Tulum, Valladolid, Holbox Island, and Cozumel is all possible! 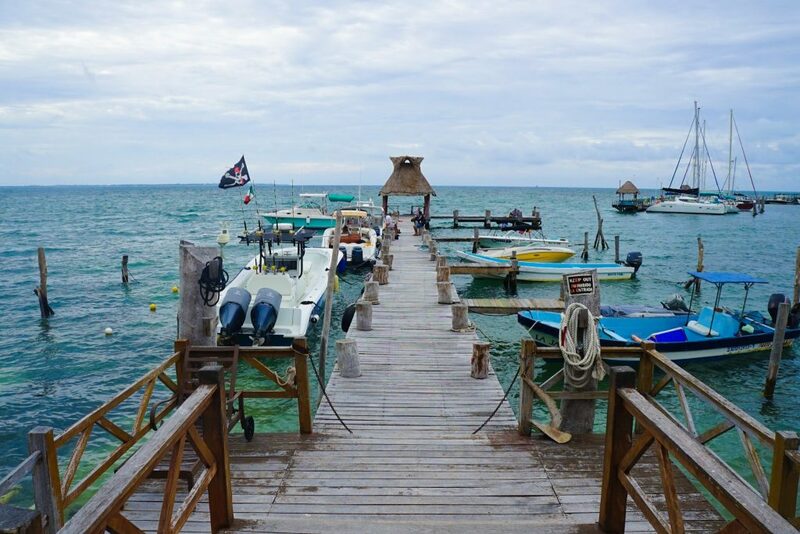 While this review is based on my experience departing from Tulum since you transfer first Cancun first this guide also applies for whale shark snorkeling Cancun – as once you’re on the boat everything is the same! I signed up for a trip with Mexico Whale Shark based on their competitive prices, professionalism, previous reviews and ability to offer the best place to swim with whale sharks from Tulum, however, once on-board I found so many more reasons to book with them over their less-scrupulous operators. 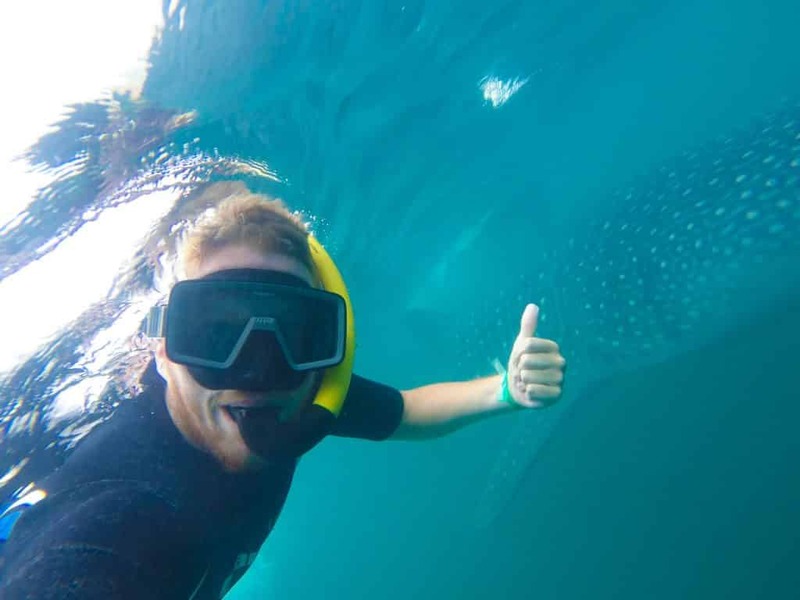 Read on to discover more about the life of whale sharks, what a swimming with whale sharks day trip actually entails and why you should book with Mexico Whale Shark. 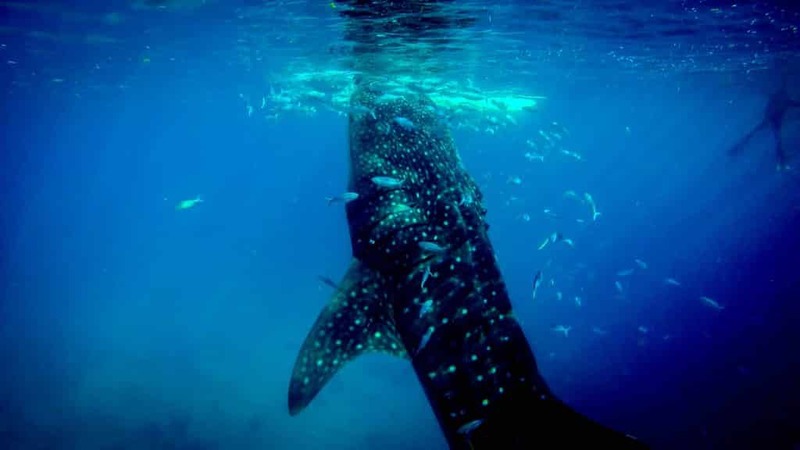 Find The Best Accomodation Options In Tulum Now..
What Even Is A Whale Shark? 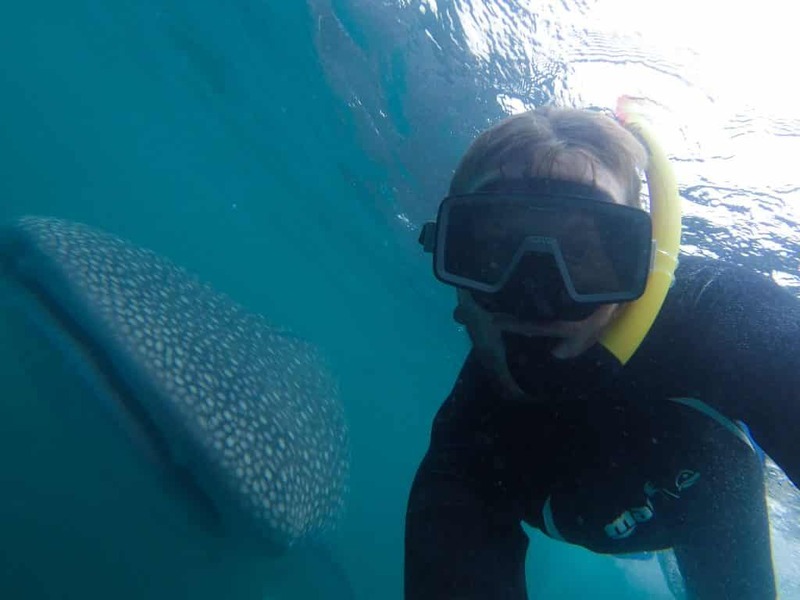 Where To See Whale Sharks You Ask?! When is Whale Shark season in Cancun / Mexico? 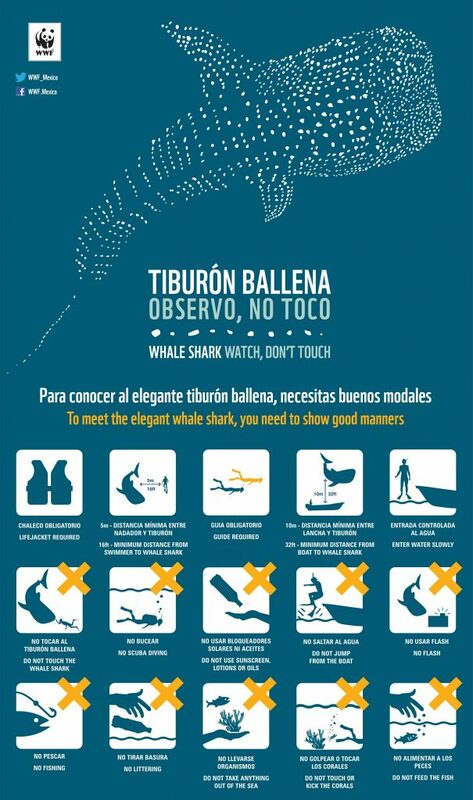 Tiburón Ballena in Spanish – the first thing you should know is whale sharks are actually sharks, not whales. Most people are surprised by this given their size, docile nature and feeding style (they are filter feeders – just like the Blue Whale! ), but trust me I double checked! Whale sharks are the largest fish in the world and can grow up to 12 meters and weigh 19,000 kilograms – That’s 19x times the weight of a Great White Shark for those that are counting! These gentle giants feed by scooping up plankton – micro-plants and animals, along with any small fish that happen to be around, with their huge gaping mouths while swimming up close to the water’s surface – and while individual plankton may be small, there are so many in the ocean that the whale sharks can easily get to and maintain their impressive size by hoovering them all up. Globally whale sharks are listed as critically endangered – which is honestly insane given the tourism benefits they provide – in large part they’re still being hunted in parts of Asia, including the Philippines because their meat, fins, and oil are highly valued on international markets. They sadly can also be victims of by-catch in fishing gear. Want to learn more? You need to watch Shores of Silence, the landmark film which brought about major legislative changes to protect whale sharks worldwide. 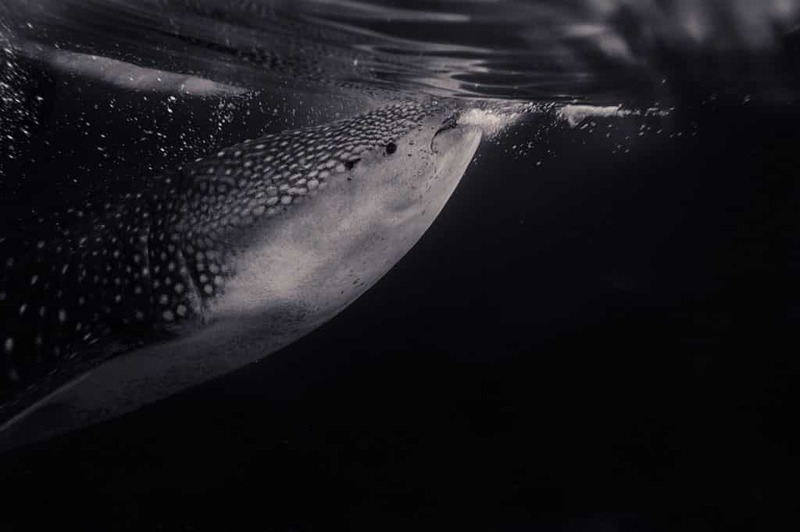 Since Whale sharks prefer warm waters they populate practically all the tropical seas around the world – but are known to be highly migratory, following the supply of food, and so not all locations are created equal! 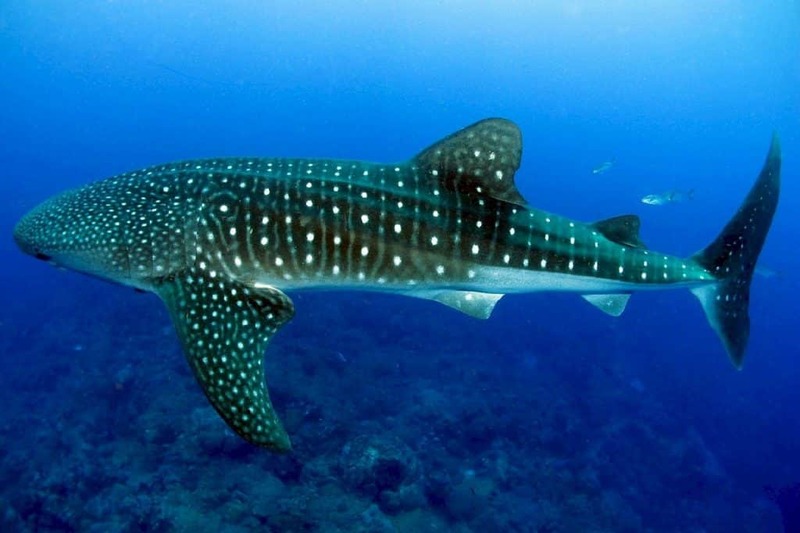 Whale Sharks are well-known in Ningaloo Reef off Australia and in Cenderawasih Bay in West Papua. Most of these places would be the best locations for swimming with whale sharks worldwide, except they are very remote and insanely hard-to-reach locations. Another famous whale shark diving place is the Philippines fishermen import food from other regions to feed and artificially attract the whale shark. Let’s just say this is more than a little controversial and biologists are currently facing off over such whale shark feeding practices. Luckily there is also one other famous location for whale shark trips – which is [in my opinion] one of the best places to swim with whale sharks. 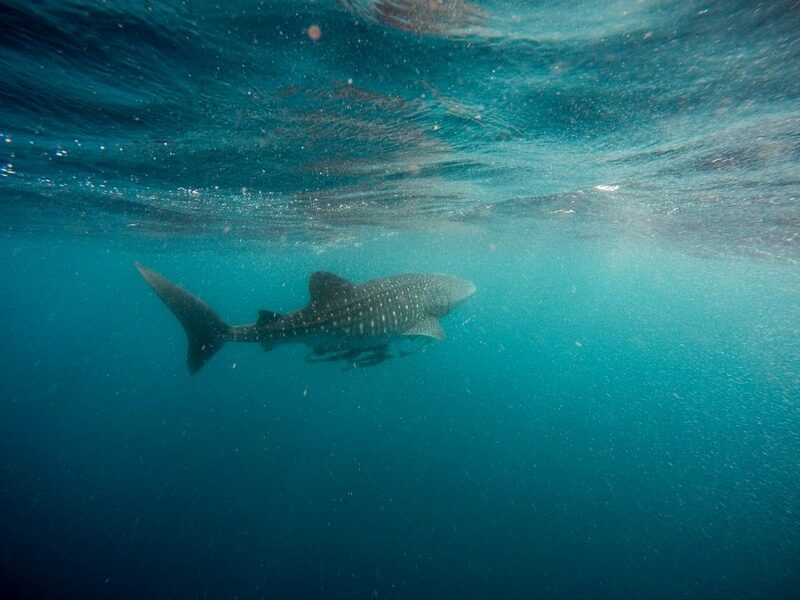 With an almost guaranteed success rate of whale shark sighting’s in season, great facilities, low prices and plenty of air connections it’s swimming with whale sharks in Cancun and the Mayan Riviera of course! Every year on May the 15th, the whale shark season in Mexico officially kicks off in the warm Mexican-Caribbean Sea just off the Yucatan Peninsula as thousands of whale sharks begin to arrive for the annual all-you-can-eat plankton buffet here! 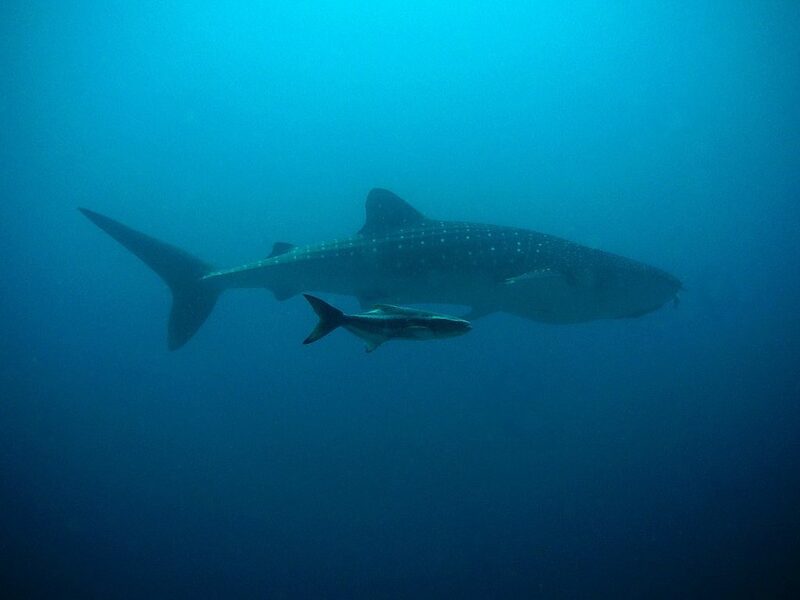 The whale shark season in Mexico officially runs from the 15th of May until the 15th of September and runs every day except in bad weather and the 30th of every month (to give the animals a break and in celebration of International Whale Shark Day on the 30th Aug!). Of course, you can always try swimming with turtles if you are not visiting in season! While whale sharks are frequently spotted in this time frame (with only 2-3 days per season none are spotted generally!) their sighting’s do peak in July and August. 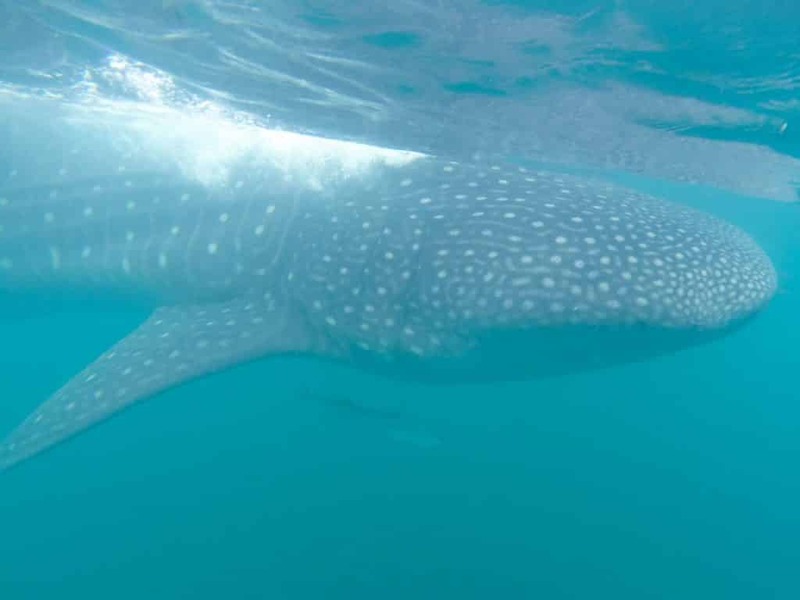 If anyone planned – like I did – to make a trip to Isla Holbox for whale shark tours, sadly it seems that the days have long gone where whale sharks could be seen just off its shores. 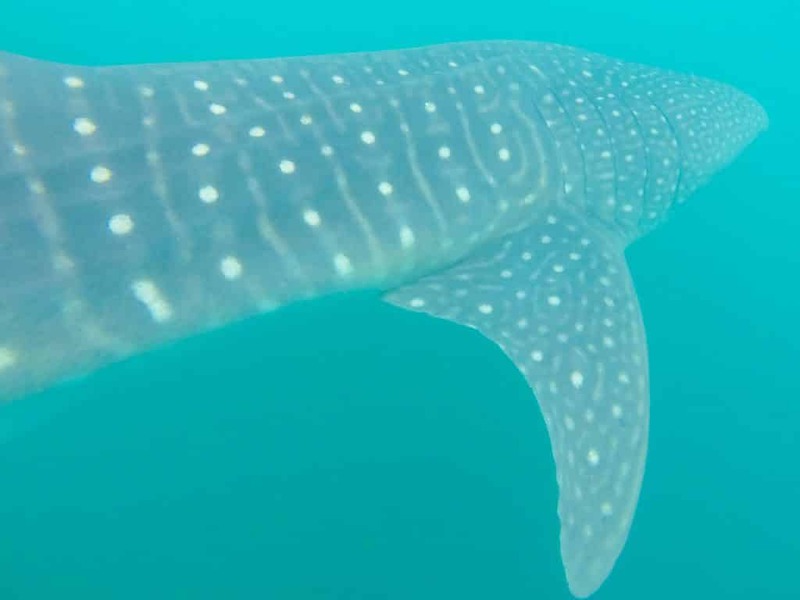 Thankfully for anyone considering whale shark snorkeling in Cancun these gentle giants now tends to be seen closer to Cancun and Isla Mujures – with some of the densest populations of whale sharks recorded in the world! This is bad news for whale shark tour operators in Holbox, who must now spend significantly longer traveling down the coast to find them…but its now better for tourists who can now go with Mexico Whale Shark from any hotel in the Mayan Riviera including Playa del Carmen and Cancun with just a short shuttle transfers to the whale shark excursion Cancun’s private marina (at one of the closest land points to the current whale shark location). 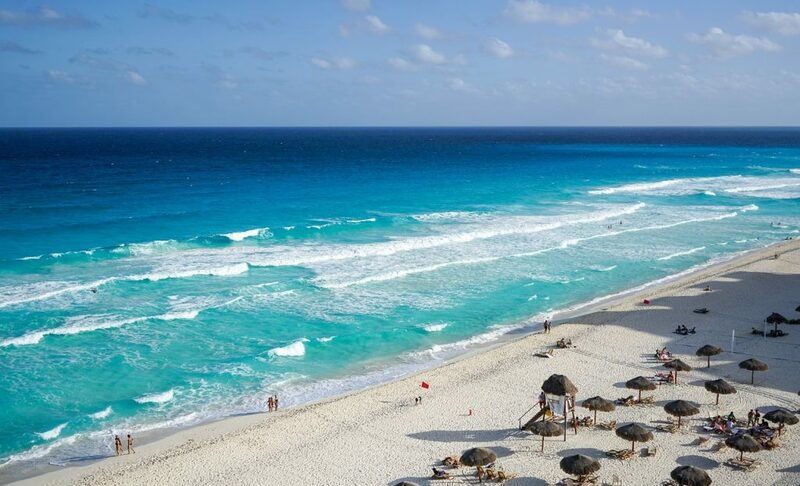 You can also see whale sharks from Tulum with a 2-hour transfer up to Cancun. This does make whale shake swimming a long day from Tulum but the shuttles are modern and clean making the whole process very painless and comfortable. I recommend this option if you are not planning to head further north up the coast. A trip with Mexico Whale Shark will start with a quick shuttle transfer from most hotels in Tulum, or if you are in an AirBNB or non-included hotel then a pre-arranged meeting point. I went on the Mexico Whale Shark Tour from Tulum and it took about 2 – 2.5 hours up to their private marina and we made three shortstops on the way, though I’ll be honest the main highway here is so good and the shuttle so comfortable I did sleep for the whole trip. At Mexico Whale Shark’s private marina we were given a proper safety briefing and explained the rules (see the rules for whale shark snorkeling later). Included in our Cancun whale shark tour was a hearty breakfast of coffee, orange juice, cake and sandwiches. If you’re are prone to sea-sickness you might want to consider not eating and bring you own *non-drowsy* seasickness pills as none are available to purchase. You can, however, hire a wetsuit here for $13 USD, which is highly recommended as otherwise, you must wear a life-jacket in the water with the whale sharks. You can also hire a GoPro for $40 USD – which again I highly recommend if you do not have your own underwater camera. You can, however, get a knock-off Go Pro to own for less than $40 USD on Amazon before you go to use for your whole trip. Either way, make sure you get pictures as you do not want to forget your whale shark snorkeling experience in Mexico! After a quick-turnaround here, we were all split into groups of between 6-8 and all boarded separate boats which were great to avoid overcrowding on the boat. I was really surprised by the quality of our boat, which was large with plenty of space. There was a bathroom, unlimited refreshments kept on ice, shade, a non-slip floor through-out, a ladder for re-entry and two large motors – and of course a dedicated captain who did a great job of navigating the choppy seas that day. Our Cancun whale shark tour captain was also an expert at pointing out the wildlife (sailfish, turtles, manta’s etc) as we took the 1.5 hours out to the whale shark spotting site. In more optimal weather this journey only takes 1 hour, but at the beginning and end of the whale shark season in Cancun, conditions can be very rough! Trust me, non-drowsy sea sickness pills are essential..
Once out in the open ocean for the whale shark watching our captain was quick to spot the first one. We had all previously been kitted out with flippers and snorkels – which were of the surprisingly high quality I must say, and better than many dive shops! 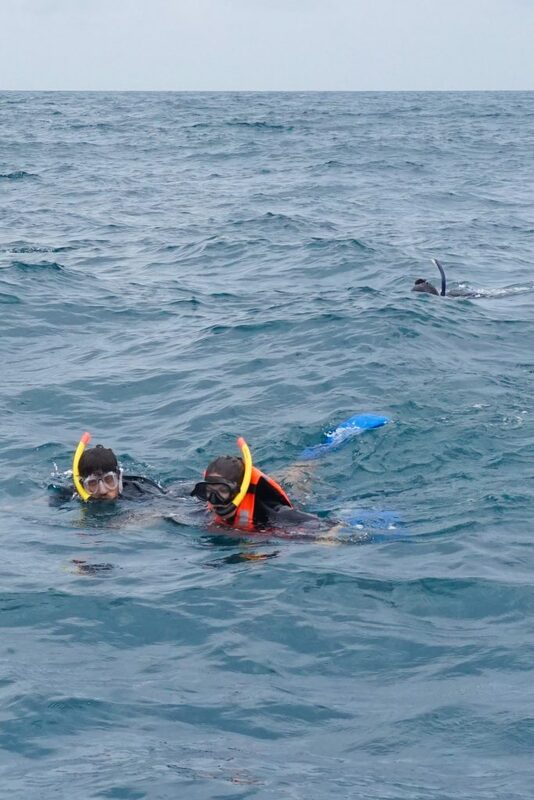 Then the first two from our group were off in the water for their life-changing encounter with a whale shark. On the day we went out only 6 whale sharks were spotted (only was the wording of our captain – I was supremely happy with one!) so all the boats split off somewhat evenly with each whale shark, so on our day our whale shark ended up with about 6-7 boats, with each boat except the boats whos ‘turn’ was next keeping their distance. I am told up to 400 whale sharks can be spotted in peak season, but it’s nature so it just depends on the day! 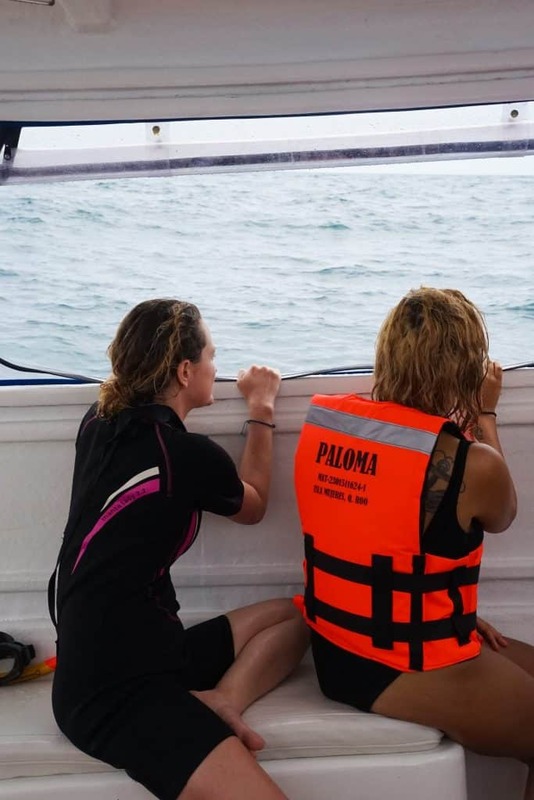 Yes, there are quite a few boats, and yes – it is touristy, but it is an incredible experience and I truly believe from what I saw it is sustainably managed and the operators truly care about these gentle animals. 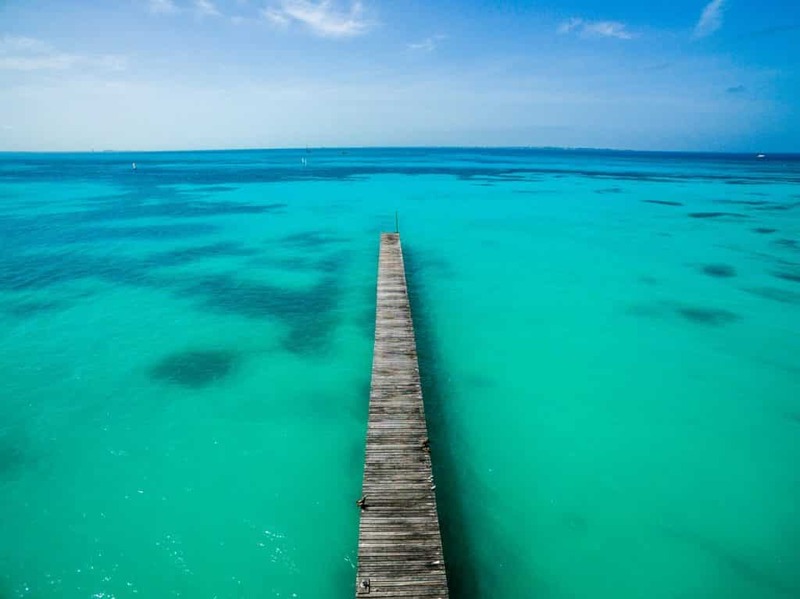 I plunged into the Caribbean as our Captain signaled to GO, GO, GO!!! I put my head down, swam forward and stared into the deep blue!!! 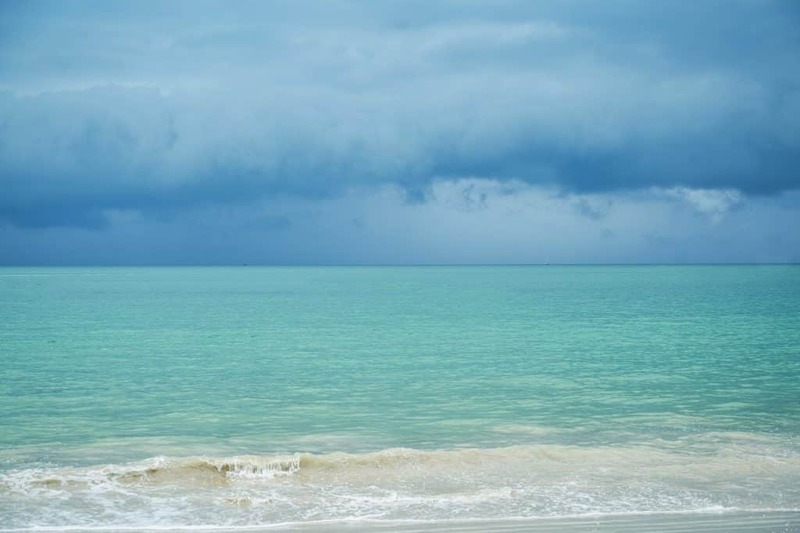 There had been a storm the few days before we went – The Whale Sharking was canceled and the water was still uncharacteristically murky, but nowhere near enough to ruin my whale shark swimming in Cancun experience! Suddenly, out of the ocean emerged this gentle giant – mouth gaping – as if he was smiling to meet! He was busy chowing down on lunch and effortlessly glided by at which point I frantically started kicking to keep up with him – not an easy task, but entirely possible! I was able to look right into his soul, admire his grey-and-white coloration (which is why locals refer to whale sharks as domino’s) and stare in awe at his giant size. There is truly nothing like this in the world – and I was 100% in love. In this month the early morning rise, boat trip – and price! – had all been entirely worth it. I was face-to-face with my spirit animal, and loved it! I went in for a selfie and he happily obliged, like it was nothing, and just continued swimming. I wondered briefly how I would feel if someone took photos of me eating, but decided the whale shark wouldn’t mind as he was just so beautiful! After what felt like an eternity and a second all at once, he dove down – clearly full for now. We swam back to the boat, heart-pounding, spirit’s high, and all giggled like little girls about how fulfilling and unique ouCancunun swim with whale sharks had been! I’m glad he was as happy to meet me as I was to meet him. 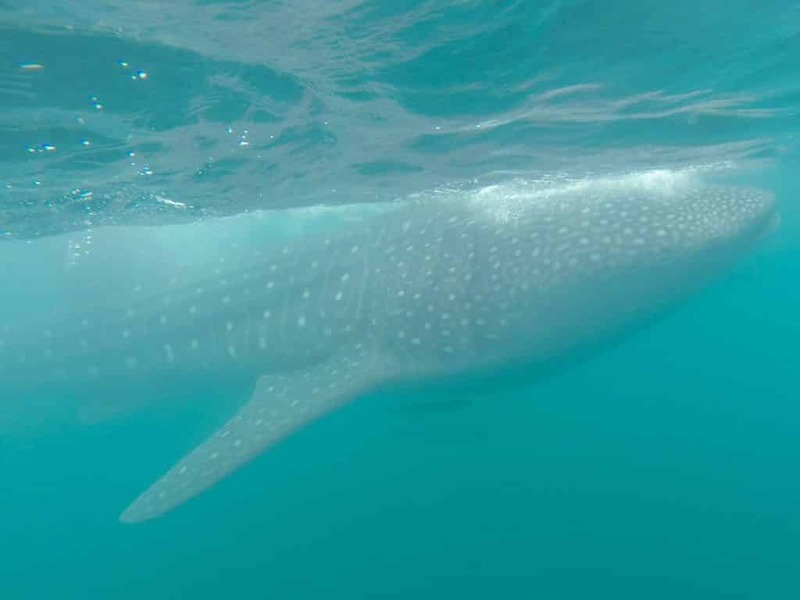 Whale shark swimming in Mexico success story right here! We each got one more snorkeling go with this incredible master of the deep, except the second time was better as we were more prepared in terms of kicking and snorkeling! The conditions and whale shark sightings on the day dictate how long your time with the shark is, and how many goes you get! Two times in the water is the standard, and while you could never have enough time with these incredible creatures I was very satisfied. We left the site around 12 as did all other boats so I take solace in the fact that the sharks only have contact for a few hours each day, and at any point they can simply dive down if they don’t like the contact – but based on what I saw they kind of bask in the attention. On the way back we spotted some more turtles and manta’s in the open ocean, stopped at a beautiful reef for a bit of snorkeling and dined on some fresh ceviche prepared by our captain. After we returned to the dock it was a quick and smooth transfer back to our hotel’s for a much-needed rest! An amazing day full of memories I will never forget – Yes, Whale Shark Tours from Cancun or Tulum with Mexico Whale Shark are highly recommended! Judith Morales of WWF’s Mesoamerican Reef Program. Do not use any tanning lotion or oils before swimming with whale sharks. Try to find coral reef safe sunscreen that will not be harmful to fish and coral and are biodegradable & oxybenzone free! Enter the water slowly and do not jump as you can hurt yourself or cause undue stress to the animals. Keep a distance of 13 feet or 4 meters from the whale shark at all times. They are big, so no need to get any closer! If the viewing is in a reef – Do no stand-up and take care to not kick, touch or disrupt corals in any way. Ensure whoever you go with is full licensed, compliant and follows the rules. The Mexican Army can and does, detain boats who break these rules. I can say with certainty that Mexico Whale Shark tours follow the rules and were very firm with them. No exceptions. I loved seeing whale sharks from Tulum with Mexico Whale Shark because of the professional service, fine-tuned program, ease of communication and superior experience offered. As I already said – their shuttle was flawless, arriving exactly at the designated time and place and was very clean. They also had asked my number in case anything did go wrong. The whole day swimming with whale sharks we did not need to worry about anything – the safety briefing was clear and concise, refreshments were offered at all the right times, the guide and captain were very friendly and willing to answer any questions and were fantastic at spotting the whale sharks. The only thing I could fault here was I would have liked to get a bit of background to the whale shark before-hand and therefore would have appreciated a quick 5 minute summary before we headed out (or while waiting for our turn) but as I said, the captain did answer all my questions and have accompanying pictures, maps and infographics on his phone! The boat was also one of the best out there and being a two-hull style was very stable – some of the other company’s boats look very old, much smaller with more people and we saw a lot of people being sick on them! 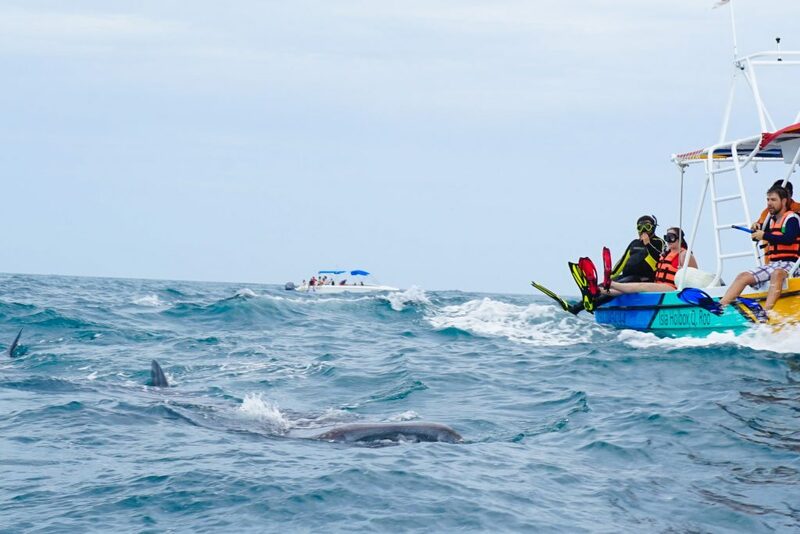 Examples of boats you do not want when whale shark swimming in Mexico – exhibit A (the middle). Mexico Whale Shark offer’s transportation from any hotel of Riviera Maya, Playa del Carmen and Cancun in addition to Tulum Town, all of which as a fair bit closer – and there is no stress then finding your way to the port! If it is canceled one day it’s nice to know they offer multiple pick-up locations around the coast if you are on a multi-destination holiday here, but if you cannot reschedule then a full refund is of course offered. 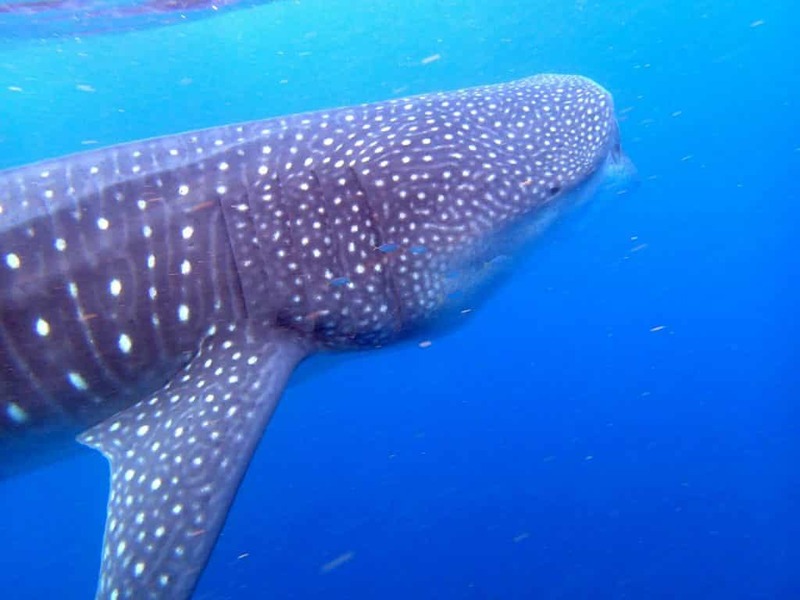 It is important to note that swimming with whale sharks from Tulum, or actually with all of the whale shark tours in Mexico, is not like diving the cenotes or visiting Mayan ruins. 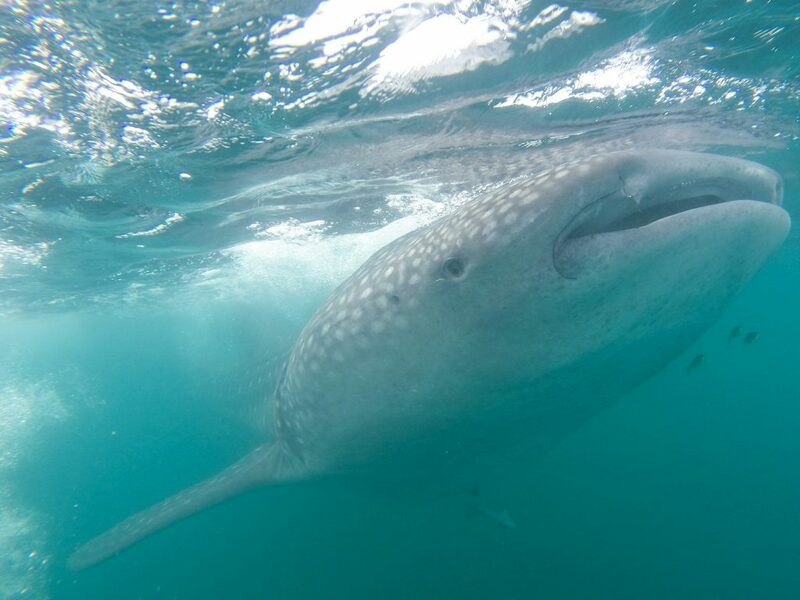 The Cancun swim with whale sharks are very weather dependent, and while the port is generally open for most of the whale shark season in Cancun it is good if you allow some flexibility in your plans. By this I mean check if you can switch your diving in the Mayan Underworld or visit Chichen Itza without the crowds before you book in case snorkeling with whale sharks from Tulum or Cancun requires a date-change. Bonus Tip: If you can, swim with whale sharks in Mexico on a sunny day, the sun attracts the plankton closer to the surface of the water and so – more whale sharks can be seen! Make sure you book your Mexico Whale Sharks tours before you visit Tulum or Cancun. Not only will you save stress and time on the ground trying to organize things if your ideal dates are sold out, but it also ensures you are not duped into an inferior service! 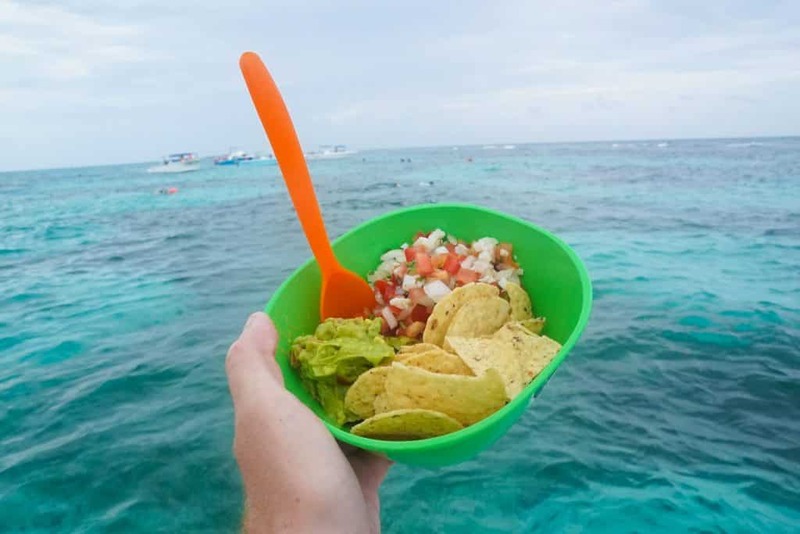 The price includes round-trip shuttle transportation from Tulum, the entire tour with the whale sharks and snorkeling at the reef as well as all the snorkeling equipment needed and of course the food and drinks. There were no hidden costs and everyone I spoke to, as well as their TripAdvisor reviewers, were very, very happy with the service – as was I! They also appear to be the only tour operator who actually own’s their own boats, and the marina, meaning they can ensure a consistently high service and all of their customers are kept together! So to recap! Where is the best place to swim with whale sharks? 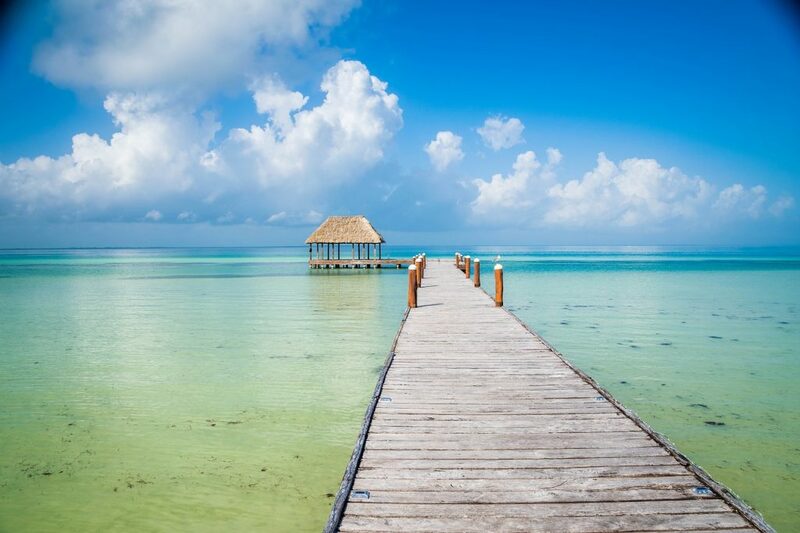 Cancun, Riviera Maya, Playa del Carmen and Tulum in Mexico. And Mexico Whale Shark tours offer the best and easiest opportunity to swim with Whale Shark from Tulum. Mexico Whale Shark tours also offer an unforgettable experience with a great crew, equipment, food, and boat – and for me, everything was perfect from beginning to end, from pickup to drop off. If you are in the Yucatan for the Mexico whale shark season this is truly one bucket-list item you cannot afford to miss and trust me …You will not regret it! 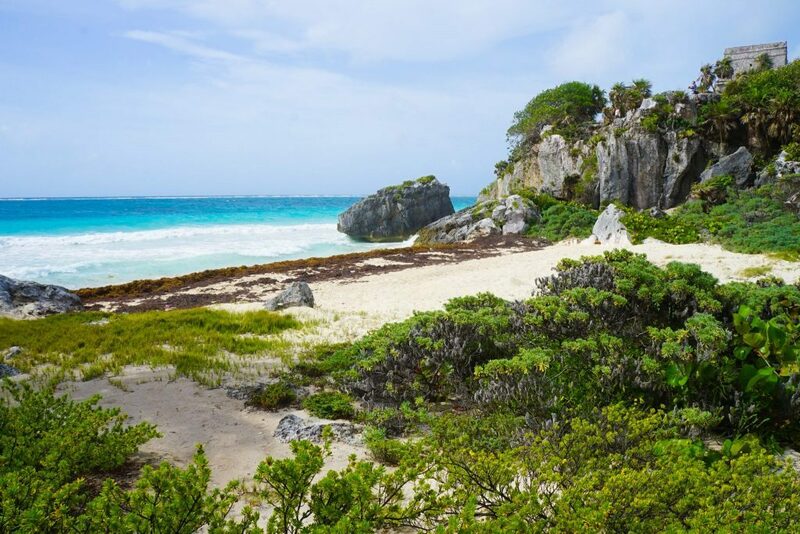 When planning a trip to Tulum Mexico – location is key, I would honestly be remiss if I did not recommend you to only consider Tulum accommodation options in the Hotel Zone. 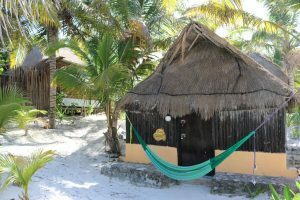 This is because although many cheap Tulum boutique hotels have sprung up in the town, the location is just not there (yet!) and as we all know: location, location, location is key! 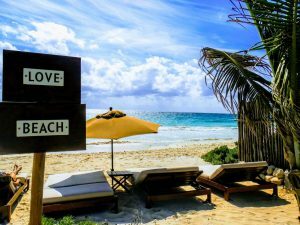 So here are my favorite Tulum beach hotels to enjoy those gorgeous Tulum sunsets and soft, white sand right on your doorstep, and while prices vary significantly I have put together three great options for you to consider with great location, prices, reviews, and amenities! 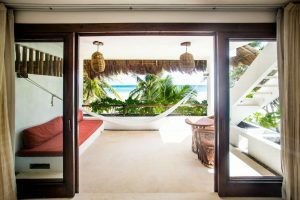 Adults-only with beach-front rooms with stylish, minimalist décor, an enviable outdoor pool and one of the best Tulum beach clubs – This is one of the most highly rated Tulum Hotels and books out fast! –> Check it out!